They’re not little kids anymore, it’s okay. It makes many people cringe nowadays. But it also still manages to make some swoon (even though swoon is a recent term made popular by R-Patz.) They have a new single and eventually a new album one would assume? I take it that super band didn’t go so well then Taylor, or are you just trying to cash in on the fact people know who you are again? Anyway. I’ve listened to and watched the video for the new single called “Thinking Bout Somethin”. And well gosh darn, if it isn’t good. Catchy even. At this point someone told me to go wash my mouth out and, admittedly, I almost did head for the soap. 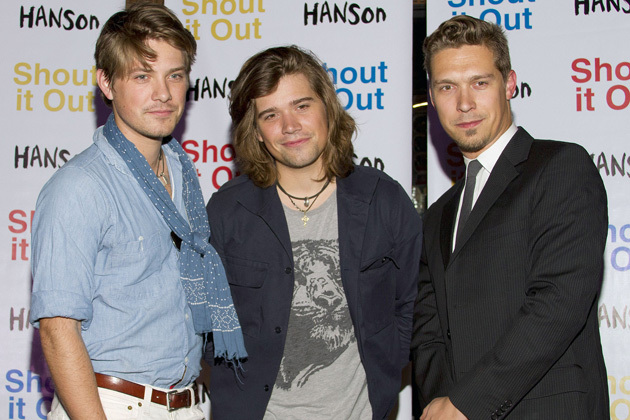 Because Hanson are supposed to be taboo right? They’re that ultimate guilty pleasure, but no one ever confesses to it because it is just too shameful. You will be shunned if you admit to liking them. Well, I already am a hermit in a hole of my own making, so it’s okay. Oh, and by the way. They’ve grown up, which does wonders for how they look and sound. Their myspace page has details, but thanks to my sister-from-another-mister she found the YouTube video, which is probably an easier watch because I had issues with the myspace player. The video is just as amazing as the song. One word came to mind: Hairspray. Not the original with Ricki Lake, but the remake with Zac Efron. ← Month of massive gig madness. Mean.